Thrilled to share this very seasonally smart post by Jane Blanchard! Fantastic ideas! If you’ve been around kids for any length of time, you know they have copious amounts of energy — so much that it can sometimes feel exhausting to watch. Outdoor play is a great way for children to run out their energy, develop their imaginations and explore the world around them. 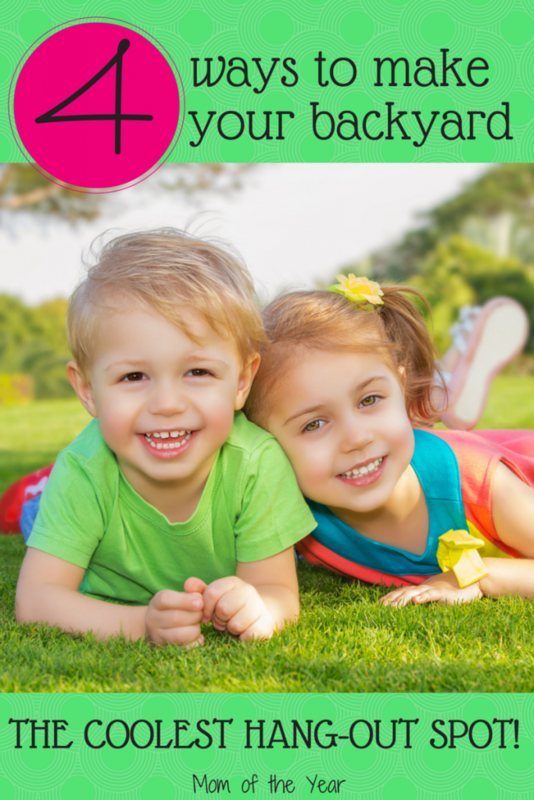 With a few simple additions to your backyard, you can transform your space into every child’s dream playground. 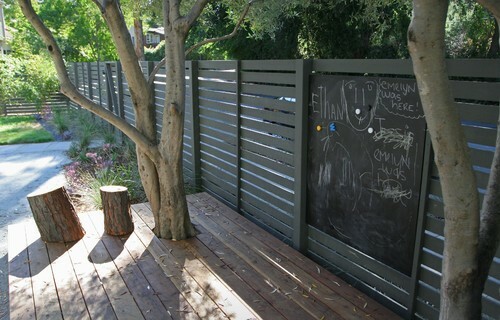 For endless hours of artsy fun, convert a section of your fence into a chalkboard. As a great weekend DIY project, simply gather some blackboard paint, paintbrushes and a sheet of wood. In addition to traditional chalk, you can use brightly colored pastels, chalk markers and even spray chalk for your children to draw and design. Let your kids soar to new heights by building a fort in the trees. While the model pictured is a five-star design, a more simplistic tree house would be just as enjoyable. 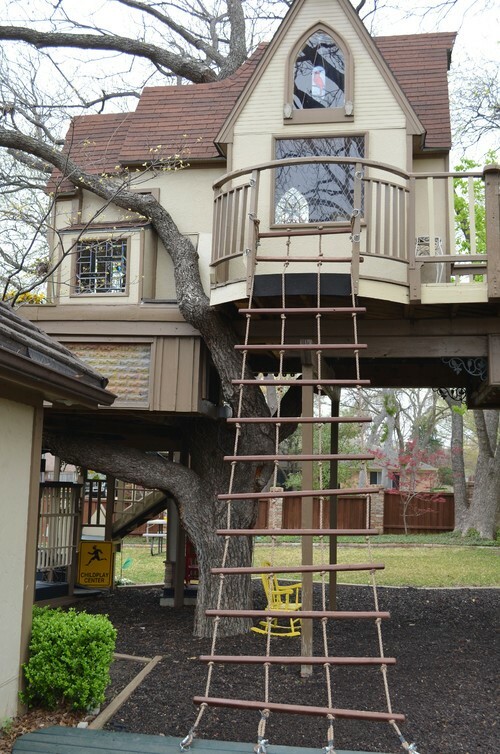 Especially entertaining for your little explorer who loves to climb, tree houses with ladders, ropes and windows offer clean outdoor fun surrounded by the beauty of nature. With memories flooding in from your own childhood, you may just find yourself monkeying around out there more than the kids. 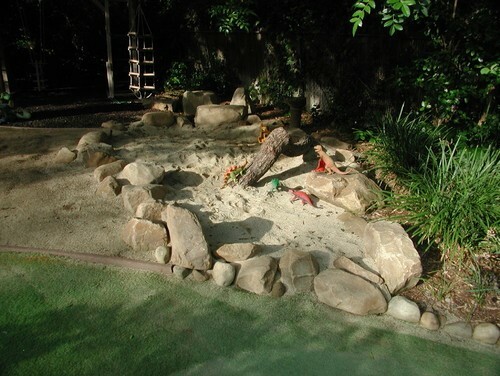 Bring the beach to your backyard by creating a sand pit. With buckets, shovels and other sand sidekicks, they can create to their hearts’ content. As shown in this picture, enclosing the pit with large rocks helps keep the sand contained while adding a unique design element to your backyard. 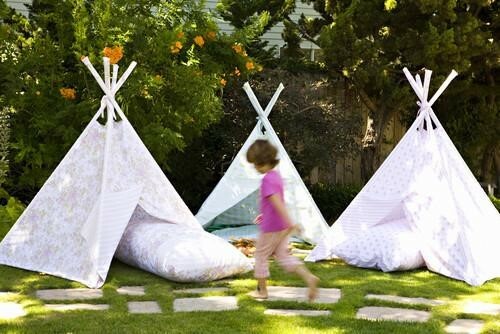 For cool shade during the day and starry slumber at night, try building forts and teepees. Since children love little hideaways and spaces they can call their own, miniature camps like these are sure to be a hit. While you can purchase wee wigwams similar to those in this photo, half the fun is building them. A few poles and a sheet are all you need to create this amusing tent. Invite a few friends over, build a fire and roast marshmallows for a slumber party they will never forget. I love the chalk board idea! Beats using my front door with glass chalk for the grandkids! Isn’t that a fun one? I want to figure out a way to do this in our own yard too! Love that you do glass chalk, though, Cindy! I’m in my 40’s and I WANT a backyard chalkboard!!! I know, right? 😉 Would be prefect for parties and such!